Muslims and Arabs who openly identify as Zionists are growing in number – powered by the freer flow of information and ideas made possible by social media and the search for answers in the wake of the Arab Spring and Islamist terror. A new Facebook page for Arab supporters of Israel has attracted about 20,000 visitors. The page, which shares content in English, Arabic, and Hebrew, was founded by a religious Jewish woman and an Arab man. It posts examples of Israel treating Arabs and Muslims with kindness and shares surprising Arab support for Israel from across the Middle East, including Tunisians who created an Israeli flag after being unable to buy one, and who have faced threats for their views. Muhammad Zoabi entered the spotlight as a proud Arab, Muslim Zionist in the summer of 2014. Just 17 at the time, Zoabi began to advocate for Israel in English, Arabic, and Hebrew. He posted a video demanding that Hamas release three Israeli teens who had been kidnapped a few weeks before Operation Protective Edge. Death threats soon forced Zoabi into hiding, and he found shelter with Kay Wilson, who had survived a brutal 2010 terrorist stabbing attack. Zoabi became so popular that he reached his maximum friend limit (5,000) on Facebook, where there is even a page calling for him to be prime minister of Israel. Zoabi's Zionism is hardly surprising, given his upbringing. His mother, Sarah Zoabi, revealed her Israeli patriotism on national television. She introduced herself on the popular Israeli show "Master Chef" as an "Arab, Muslim, Israeli, proud Zionist" from the northern city of Nazareth. "I believe in the right of the Jewish people to have their own country, which is the state of Israel, the Holy Land.... I want to say to all the Arabs of Israel to wake up," she continued. "We live in paradise. Compared to other countries, to Arab countries – we live in paradise." Zoabi's family also includes some fierce Israel haters, like his cousin Haneen Zoabi, who is a member of Israel's parliament but regularly uses her position to defame Israel and side with its enemies. Another young Muslim Zionist is Mahdi Satri, a 17-year old, Israeli Arab, whose Gazan father helped the Shin Bet (Israel's domestic security services) and received political asylum to live in an Arab village near Acre. When neighbors learned that his father had helped Israel's security services, his family became a target. "After 3 years of violence against me after coming out publicly with my Zionism and I'm still the last man standing, standing against my village," he wrote last month. "I regularly get threats. I get threats from people in my village and they say they will put two bullets in my head If I'm not gonna stop. I also get threats from Gaza, and from Ramallah, and from my mother's family." A day earlier, Satri published critiques of Hamas and the Palestinian Authority, blaming each for Israel's 2014 war with Gaza and defending Israel's use of force to protect "all the Israeli citizens: Jews, Muslims, Christians, atheist, Gays, Lesbians." He proudly notes that "Israel is the only democratic state in the Middle East." 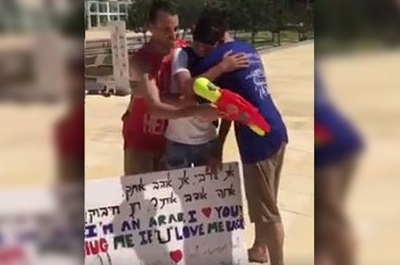 He also attracted international attention last month with a social experiment in which he blindfolded himself and held a sign identifying himself as an Arab and inviting Tel-Avivians to embrace him. His heartwarming video (with nearly half a million views) reveals Israeli tolerance and was shared by the pro-Israel group StandWithUs. Satri even paid his respects to the parents of Hallel Yaffa Ariel, who was stabbed to death in her bedroom by a Palestinian terrorist (Israeli TV news covered Satri's remarkable visit). "When they murdered her, they also took a piece of my heart, of me." He brought a yarmulke and an Israeli flag to his condolence visit. Ahmed Meligy, who identifies himself as a proud Egyptian and Muslim, is another passionate advocate for Israel. Meligy has endured death threats and police arrest for his activism, which includes blogging for the Jerusalem Post, and supporting democracy in Egypt and warmer ties with Israel. Another Egyptian-born, pro-Israel activist is Nonie Darwish, the founder of Arabs for Israel. In an interview, Darwish told the Investigative Project on Terrorism that her Zionist convictions were most strengthened by "the decency, humanity and integrity of the Jewish people in the face of adversity." She is friends with about a dozen Muslim Zionists and "will not have Muslim friends who do not support Israel." Darwish left Islam for Christianity, as recounted in her book, Now They Call Me Infidel. Speaking to IPT, she said that "at the core of Islam is a deep envy of Jewish culture...Islam has violated all 10 commandments for the sake of jihad and to repel and destroy whom they envy. Islam...wants to destroy the competition." Qanta Ahmed, the daughter of Pakistani immigrants to the UK, is a devout Muslim who has also warned about the risk of allowing Islamists to use Islamic blasphemy laws in order to monopolize the marketplace of ideas: "Americans and anti-Islamist Muslims everywhere must ensure that...freedom of...speech prevails, if religious freedoms and liberal democracies are to be preserved." An accomplished physician who practiced medicine in one of Islam's most conservative societies, she published "In the Land of Invisible Women: A Female Doctor's Journey in the Saudi Kingdom." Ahmed, who is now based in the U.S., has also eloquently supported Israel in her writing and decried the double standards applied to Israeli victims of terror. Mosab Hassan Yousef also is an Arab Zionist who converted from Islam to Christianity. He is a Palestinian who worked undercover for the Shin Bet, from 1997 to 2007, but that was not his original plan. "I wanted to infiltrate the Israeli Shin Bet in order to play a double agent and it ended up absolutely the opposite" after seeing Israel's values and humanity, he said in a 2013 Fox News interview. So I worked for them against Hamas movement ... against evil ... I did what was right to save a human life – Palestinians and Israelis." Yousef's information is credited with preventing dozens of suicide attacks and assassinations of Israelis, and with exposing numerous Hamas cells. It also helped Israel to hunt down many terrorists, including Yousef's own father, Hamas leader Sheikh Hassan Yousef. Yousef's story eventually became the subject of a best-selling book, The Son of Hamas, and a documentary film, "The Green Prince." Yousef, who discovered Christianity in 1999 and converted by 2005, has said that groups like Hamas, Hizballah, Boko Haram, ISIS are "all killing in the name of Allah." "Israel is light, Israel is philosophy, Israel is values and ethics," he said during a 2015 speech before AIPAC. "And I cannot imagine the world without Israel." The failure of the "Arab Spring" may help to explain the growing trend of Muslims and Arabs supporting Israel. As the hope of democratic reform faded and states crumbled into violent chaos and/or merciless crackdowns on protests, some willing to look past anti-Israel propaganda might admire the only example of a Middle East democracy that tolerates dissent, has a burgeoning economy, upholds the rule of law and human rights, and protects minorities. For example, after Mohammad Hosseini escaped the horrors of ISIS in Iraq, he began to question many of the anti-Israel beliefs on which he was raised. "I wanted to check the essence of the conspiracy theories, which are common in the Muslim and Arab world against Israel and the Jews," he wrote. "People told me that America and the Jews are responsible for all the problems but on the contrary I saw imams and many religious people joining ISIS willingly and out of admiration." His research changed his mind about Israel and its conflict with the Palestinians. "As long as people are committed to the destruction of Israel the Israelies (sic) have an obligation to defend themselves first," Hosseini added. "I want the Israelies (sic) to know that Israel has supporters amongst us. I hope that the Palestinian party would realize that it is unreasonable to kill and then come with demands against Israel, negotiations should be commenced with pure intentions." Moreover, the singularly brutal approach of the Islamic State (ISIS) towards religious minorities, or even Sunni Muslims who dare to disagree with ISIS, does much – by way of extreme contrast – to highlight Israeli society's tolerance. Religious minorities in Israel like the Druze, have clearly taken notice, and prefer life under Israeli rule. Gabriel Nadaf is a leader of the Aramaean Christian minority in Israel and a Greek Orthodox priest who encourages Israeli Christians to enlist in the IDF. In September 2014, he told the United Nations Human Rights Council that "Israel is the only place where Christians in the Middle East are safe." In February 2014, Monaliza Abdo, a young Arab Christian woman who voluntarily enlisted in the Israeli army, spoke publicly about her patriotism and determination to protect all Israelis. But even members of the majority religion in the Middle East, Sunni Islam, serve in the IDF. There about 1,700 Bedouin Arabs who serve in the Israeli army. And, perhaps as part of the broader trend of Arabs embracing their Israeli identity, Lucy Aharish, the first Muslim Arab presenter for one of Israel's top TV news channels, proudly defines herself as an Israeli: "Today, when people ask me 'What are you?' I say that I'm an Israeli. I'm not ashamed of my Israeliness. Then I'm a woman, and then I'm an Arab Muslim. That's the order: Israeli, woman, Arab Muslim." A growing demographic of Zionist Muslims may eventually serve as the bridge to peace between Israel and the wider Islamic world. But as long as Islamist movements persist, such courageous individuals will likely face serious threats. I for one am very glad to read this. I have a few friends from the ME good to know (even though Ive heard this) that there is not all hate for Israel Ive been friends with Lebanese,African,Syrian,Egyptians,Iraqis,Iranians. People are people. Grew up around ME peoples during Iranian Crisis wasn't a good time at school but, WE are making progress and I don't have stockholm syndrome. Have to admit that those school days did make a mark on my life. Good to know as a people, as a human being WE ARE BREAKING DOWN BARRIERS.. Maybe I would not feel the same if I lived in Israel. I don't know. I have a fair number of Pro-Israel Moslem & Arab friends. I recently became friendly, and am in conversation with, a guy in Kuwait. He sent me links to pro-Israel articles written in the Kuwati media. He tells me many people in Kuwait see no problem with Israel. I have another in Saudi Arabia, who subscribes to my website. Only last week I added a Lebanese guy in Australia, who made a beautiful comment on a Jewish Community FB page. I used to think all Muslims and Arabs were 'bad' and now I see otherwise. NO, I am not a leftist, in fact I am very right-wing. A lot of these people aren't Muslims as the title would have us believe. You should include practicing Muslims like Noor Dahri, Nadiya Al-Noor, Bassem Eid, Ashraf Sherjan, Amine Ayoub, and Kasim Hafeez, to name a few. Enough with the Jewish Non Muslim 'Stockholm Syndrome'! "...a nationalist political movement of Jews and Jewish culture that supports the re-establishment of a Jewish homeland in the territory defined as the historic Land of Israel..."
To call Muslims Zionists is an oxymoron. For them to call themselves that is a perverse attempt to ingratiate themselves with non Muslims and appeal to them for financial aid and succor. That Haneen Zoabi's cousin "found refuge" with Kay Wilson, a survivor of a brutal Muslim jihad attack in which her friend was hacked to death only proves how pathologically perverse this "Muslim Zionist" manifestation of the Stockholm Syndrome is. There's something inherently twisted for Jews and non Muslims to protect and support Muslims who publicly proclaim they have had a halal epiphany and begin a slobbering love affair with their self proclaimed "ex" enemies. It's time Jews and non Muslims stopped their unconditional love in return and rewarding Muslims for the simple fact that they say that Jews have a right to exist! Thank you for publishing this article. It is unfortunate that articles and news such as this does not penetrate the 'glass ceiling' of the giant media outlets in America and abroad.